Take at look at this pumpkin plant. This single plant takes up nearly as much space as nine plants did last year. To-date thare are two fruits, and they look gorgeous. I almost prefer the complexity of greens in a new pumpkin to the monotone orange of a mature fruit. 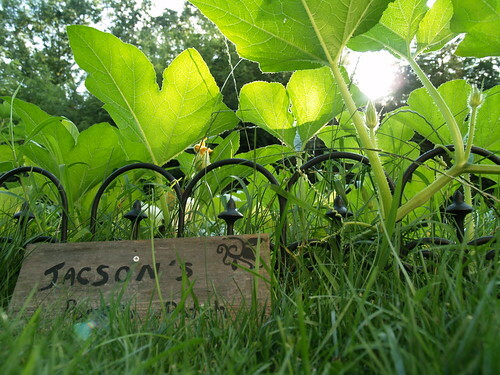 Also, we call this Jacson’s pumpkin patch. He doesn’t do much yet, but it will always be his and he can cultivate his own pumkins soon enough. That is the craziest thing! I didn’t do pumpkins this year. i was planning to do them next year, but good lord, where would i put them? 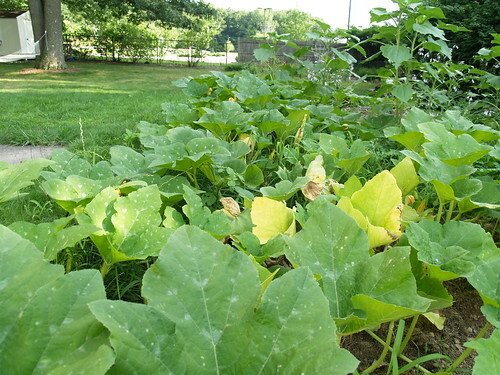 That being said, I think that squash varieties are a great beginner garden plant. My yellow squash and zuchinni plants are huge and green and prolific and they make me feel so successful! I love it. 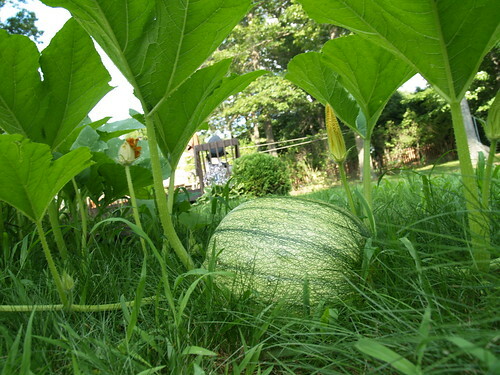 @hiphomemaker: I should note that this is a rogue pumpkin, a seed that landed in the compost last year and was turned into the ground this spring. I didn’t have the heart to pull it out after it sprouted. It even survived a transplant last month.